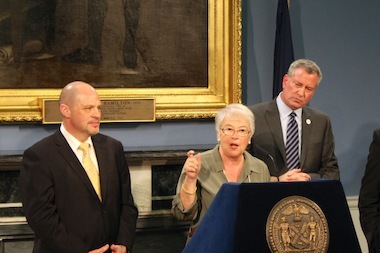 Mayor Bill de Blasio, UFT president Michael Mulgrew, and schools chancellor Carmen Farińa during the announcement of the UFT deal, the cost of which has now risen to nearly $9 billion through the fiscal year 2021. CIVIC CENTER — The estimated cost for the city’s deal with the United Federation of Teachers has ballooned since Mayor Bill de Blasio announced the deal earlier this month. The day the deal was announced, his office said the 9-year contract, which includes two years of retroactive pay and raises going forward, would cost the city $5.5 billion. But according to the mayor’s office on Wednesday, the ongoing impact of the deal, which only extends through fiscal year 2018, will bring the total cost of settling the outstanding teacher’s contraction to $8.97 billion — a 63 percent increase from the initial estimate. The teacher’s deal will continue to cost the city $3.24 billion for the three years after the deal expires, through FY2021. The new details were first reported by Capital New York. According to the mayor’s office, the new information doesn’t represent a change in the original terms of the deal, and that the ultimate cost of the deal will be significantly lower because of health care savings that the city says will be binding with the unions. While the mayor's office has yet to reveal the exact source of the estimated $2.9 billion in health care savings, de Blasio has said he is "confident" the city will be able to work with the union to bring the net cost of the deal down to $5.1 billion. De Blasio officials pointed to a number of "menu" options, including pooling prescription drug plans across all unions, and scrubbing of union health insurance rolls of ineligible participants to bring costs down. Budget observers, however, remain skeptical.